Here at F.B.I. we offer a ‘no trace no fee’ on all UK cases. We have a team of dedicated tracers who are experts with the available software and other tracing tools and methods to trace individuals or businesses that have gone away. As one of the largest independent suppliers of trace data in the UK we have the search facilities and flexibility that allows us to provide positive results in over 90% of our cases. In some cases, we only require a name and a date of birth to conduct a successful trace. We provide information on individuals, debtors, limited companies, non limited companies and Director‘s. We aim to provide powerful search facilities giving you the information you need whilst ensuring that our service remains flexible and value for money. 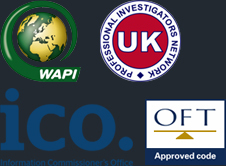 We have a dedicated team of investigators with unrivalled experience in tracking debtors worldwide, within the requirements of the Data Protection and Criminal Justice Acts. When we have located the missing person, we will provide a forwarding address and a comprehensive written report to the client.